The Burma Army, ignoring the concerns and objections of both the Karen National Union and local villagers, are planning to move ahead with plans to build road in Kyaukgyi Township of Eastern Bago Region. Despite local residents and the Karen National Union’s rejection of its plans to build the road, the Burma Army have secured government funding for its ‘local development’ project. A statement on the website of the Office of Defense Ministry on March 31, 2019 confirmed the Burma Army’s position to continue its road construction project through Than Bo – Mu Thae – Baw Sae Kho – Pla Kho – Yunsalin in Kyaunkgyi Township. Local communities affected by the road construction have rejected it. KNU officials from Nyaunglebin District claimed the road building will go through their control areas and said negotiations they had with the military had failed to reach an acceptable position. Colonel Myo Aung, spokeperson for the Southern Military Command said the budget had been secured and the construction will go ahead as it is part of local development plans. 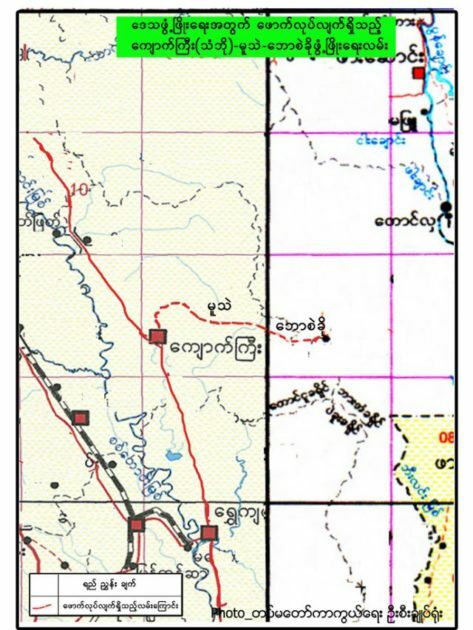 Tatmadaw [Burma Army] sources claimed the route will connect Kyaukgyi Town and Tuangoo Town as they are now upgrading about 52 miles of road and plan to widen it from 12 feet to 34 feet. On February 22, local villagers wrote an objection letter to the KNU’s Nyaunglebin District officials expressing their objections to the road upgrade by the Burma Army. The KNU’s Nyaunglebin official also informed the Burma Army of their opposition to the road upgrade. Brigadier General Saw Eh K’Lu Thein, Commander of the Karen National Liberation Army (KNLA) 3rd Brigade told Karen News that tensions would increase if the road construction goes ahead without common agreement. Speaking to Karen News, Brigadier General Saw Eh K’lu Thein said. On March 21, tensions were high between the two armies over the construction of a bridge at Mu Thae which resulted in the displacement of 13 households over fear of armed clashes. On February 23, a Burma Army bulldozer driver was shot over disagreements about road upgrades in the area.